An interactive map allows residents to enter their address to see if they live in a ‘no fireworks zone’ area where ‘Safe and Sane’ fireworks are NOT allowed. Access it here. PALMDALE – Forty-four nonprofit organizations will begin selling fireworks at various locations throughout Palmdale starting Friday, June 28, city officials announced today. Saturday, June 29 to Thursday, July 4 – 10 a.m. to 10 p.m. The Palmdale City Council approved issuing permits for 44 nonprofit organizations to sell fireworks at its June 5, meeting. Only nonprofit organizations that have headquarters in Palmdale or have more than 50 percent of their membership residing in Palmdale and have a minimum of 20 members are eligible to apply for fireworks booths. Only one booth is allowed per organization. Palmdale is the only municipality in the Antelope Valley in which “Safe and Sane” fireworks may be legally sold and discharged on private property. However, the housing community Anaverde, all areas south of the California Aqueduct, and locations in the Rancho Vista area are “no fireworks zones” and may not use any fireworks at all since they are in high risk fire areas. The “no fireworks zone” is generally described as the area within the City of Palmdale which lies along the following lines: beginning at the intersection of Rancho Vista Boulevard and 30th Street West, areas south and west of Rancho Vista Boulevard, north to Avenue N-8; south and west of Avenue N-8 from Rancho Vista Boulevard to 55th Street West; west of 55th Street West; and south from 55th Street West to 60th Street West (Godde Hill Road). View the “No Fireworks Zone” maps here and here. 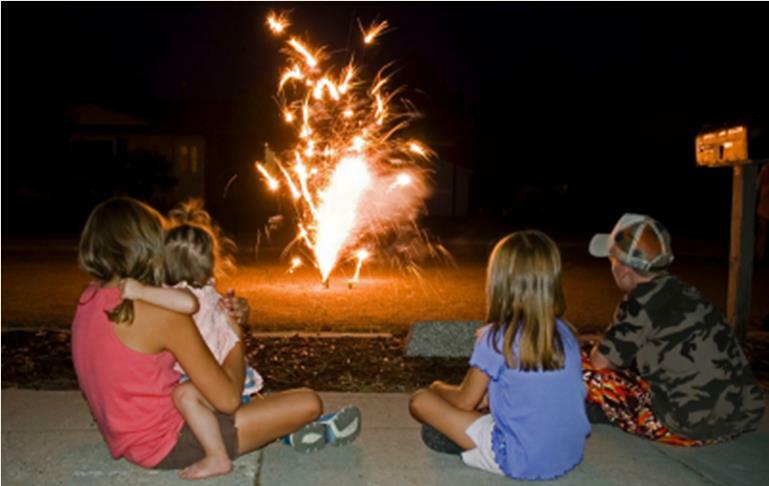 “We’ve developed an interactive map on our Web site, www.cityofpalmdale.org, that allows residents to enter their address so they can see if they live in a ‘no fireworks zone’ area where ‘Safe and Sane’ fireworks are NOT allowed,” said Palmdale’s Communications Manager John Mlynar. Access the interactive map here. Residents may also contact Palmdale’s Community Preservation office at 267-5234 or the Public Safety Department at 661-267-5181 for assistance on no fireworks zones. “Illegal fireworks are not allowed anywhere in Palmdale or in the Los Angeles County portion of the Antelope Valley,” said Director of Public Safety Anne Ambrose. “These are the type that explode or shoot up in the air, and they are dangerous and cause a real threat to life and property. “If people are caught using illegal fireworks in Palmdale, they will be facing a $2,500 fine for a first offense, $5,000 for a second offense and $10,000 for a third offense,” Ambrose added. Safe and sane fireworks may only be discharged from noon on Friday, June 28 through noon on Friday, July 5. 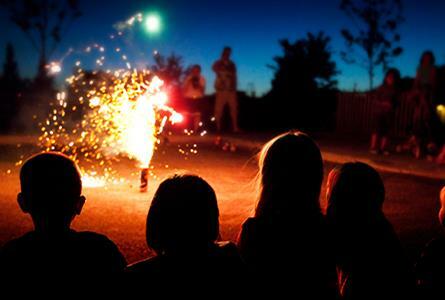 Discharging fireworks before June 28 or after July 5 will subject the violators to fines. Always read directions and use common sense. Use outdoors only—away from buildings, vehicles, dry grass and other flammable objects. Light one at a time, then move quickly away. Keep others at a safe distance. Never alter or take apart fireworks. Do not give to young children under any circumstances. Have a bucket of water handy for emergencies and for dousing misfired and spent fireworks. Never attempt to relight or fix malfunctioning fireworks. Keep your pets indoors at home in a sheltered, quiet area. Leave a television or radio playing at normal volume to keep him company. Consult with your veterinarian before July 4th for ways to help alleviate the fear and anxiety he or she may experience during fireworks displays. Never leave pets outside unattended. In their fear, pets who normally wouldn’t leave the yard may escape and become lost, or become entangled in their chain, risking injury or death. Educational flyers are being distributed with each purchase of fireworks. For more information, call 661-267-5181. Arch Rafael and St. Mina Coptic Church – 5544 Pearblossom Hwy. Desert Opera Theatre, Inc. – S of SWC Rancho Vista Boulevard & Sierra Hwy. 26 comments for "Fireworks to go on sale in Palmdale June 28"
I don’t see allowing fireworks in this dangerously high fire climate being the Safe and Sane choice. I doubt there could be enough profit from the sale of them to offset the cost of fighting a fire caused by them. Walmart in Lancaster is selling fireworks….They must have paid Rex to turn a blind eye. I was in K-Mart Sunday morning and it too was selling “fireworks”. I would have taken a photo, but I was crazy busy and in a hurry to get the heck out of dodge.. The ceiling vents at K-Mart scare me .. they have since I was a child.. lol.. The “fireworks” are next to the exit and I saw them on the way out.. These “fireworks” are actually party poppers that are always legal. Some shoot streamers from a small squib and others are the bang snaps that you throw (at each other). They sell “party poppers” not fireworks. Its all pointless – might as well name them “Safe and Boring” – gone are the fireworks that are actually any fun like firecrackers and bottle rockets and M80s. And they are overpriced for what you get. Me and GF are just gonna go watch fireworks somewhere – although the City of Palmdale and Palmdale High School website does not list any fireworks shows yet…. I’m sure something will come up. Are you a kid? Why are grown men commenting on this article like their toys are being taken away? I wonder if firework injuries occur to the same demographic as most rattlesnake bites, men between 18 and 35 who have been drinking or something like that. LOL!!!! That’s cold blooded Scott! That’s almost as funny as Drew Mercy being busted for Drunk Driving. It didn’t take long for the NANNIES to show up and want to take everything away. Sure fireworks are hazardous and only stupid people misuse them. But they are FUN. You don’t want them, don’t buy them. But MIND YOUR OWN BUSINESS and leave me and others who want fireworks alone. Let’s talk when your house burns down because someone used “safe and sane” fireworks. Leave fireworks to professionals who know how to handle them and are prepared for an emergency, should one occur. Yes, they are fun. But they are also dangerous and can be unpredictable and people panic. This is the desert and a tinderbox since we’re in a drought. Not trying to be a nanny or get in anyones business, just trying to point out the OBVIOUS. The keyword in fireworks is FIRE! When is Rex gonna ban turkey deep fryers and Christmas lights and candles and………………???? You see, you are a NANNY. I live in a FREE country, not a Nanny Socialist state. Maybe that’s what you like. I’ve enjoyed fireworks for over 55 years that when I was a kid. So YOU safely not use them and I will safely use them and you can go play tiddlywinks as far as I’m concerned. If you want real danger, remember, illegal aliens do not have drivers licenses and many drive unsafe vehicles. So just try and cross Palmdale Blvd with these folks driving around. Wow. Really? Bringing the whole illegal alien thing into the mix? I was nearly killed by a drunk driver who was white, legal and fully insured. I get that fireworks can be safe and you’re probably one of the few people who does use them safely BUT MOST PEOPLE DON’T, even when they buy them legally. My whole point here was not about FREEDOM but about SAFETY. I don’t want to lose my pets, house and cars due to a preventable accident. Oh and by the way, I too have enjoyed fireworks for over 40 years, you’re not talking to a kid here, just someone with a little common sense. I would very much like to see the evidence to support that statement. Then why bring my house into it? By the way, I’m just dealing with real dangers rather than your immagined ones. I’ve had 2, count them 2 frinds killed by an illegal driving drunk another who was run down in a parking lot and they didn’t stop (witness say hispanic no plates) and one accident I witnessed where they ran a stop sign and hit another car and fled on foot. THAT IS a REAL danger. I totally agree with you Mick. I guess this latest fire , and the fact we’re in a drought, has left liberal minds dry. No such thing as “safe and sane fireworks”. Facepalm. No such thing as a safe car either. You will always have accidents. But we haven’t banned cars now have we? It is impossible to keep everyone 100% safe at every single moment. Life is risk. And I will not have my freedoms taken away for the sake of safety in everything. The fools that go to Palmdale and buy the fireworks and bring them back to Lancaster and set them off are far from being “Safe and Sane”. Mayor Parris tried to warn you…hope you all have fire insurance!! !